A streamlined approach to collaborate on contracts at your fingertips. Creating and modifying business contracts is often a long and drawn out process for both parties. Creating contracts, Collaborating on contracts, Modifying on contracts. The challenge is to design a digital app that will improve the current process by allowing for the simple creation, collaboration, and modification of contracts. Hosted by MindSumo - Crowdsourced Ideation & Insights. I had 20 days to solve this challenge. I comprehended the problem by sketching out the flows and the wires for the app interface. The concept of Corning Contracts is to establish a streamlined approach to collaborate on contracts at your fingertips. It was necessary to have individual customizable profiles (buyers, sellers, etc.) to collaborate on this platform. The user creates his/her profile and signs in. A dashboard to summarize and access the information. The user creates a contract. Verifies information of “Price“ section. The user approves the changes made in Contract #1 from the Action Center. The approval action changes the number of pending actions associated with Contract #1; for example, before the approval, the user had 2 pending actions. Later, it changed to 1. Communicating changes in a contract. The user requests edit to the “Insurance Requirements“ section. Highlights the part where the changes should occur and adds a note for the explanation. 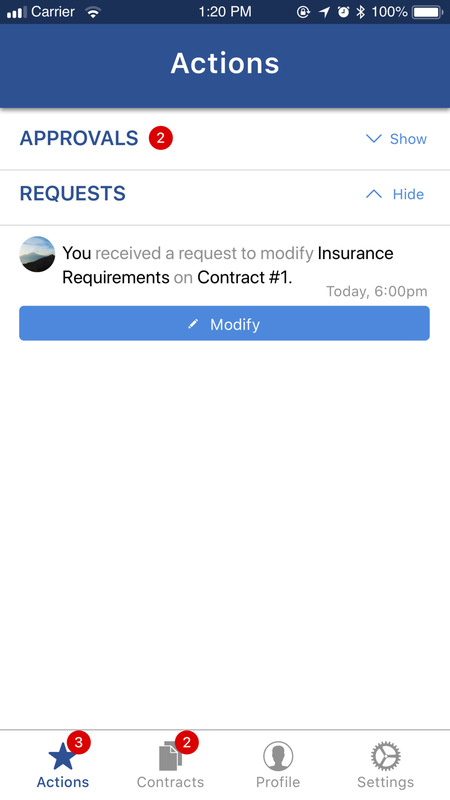 After requesting the edits, the interface communicates with the user that he/she has successfully requested the edits under “Insurance Requirements“ with a “yellow star“ icon indicator. Admin opens the note from the “request edit“ made by the other member. The App offers the admin to implement the changes manually or through its AI suggestion. Admin selects the AI suggestion. The changes made are indicated by “yellow-colored“ text for better visibility. It’s essential to know how the design is conceived by the users. The app screens were tested with 16 diverse participants (from USA, India, Saudi Arabia) online using Optimal Workshop’s Chalkmark tool - A first-click analysis tool. First-click analysis results identify if the customers are able to find what they’re looking for quickly and easily when they land on the app screen, and if not, where they click instead. View the request to modify contract. iOS 11 iPhone GUI template from Facebook Design, Sketch & Origami Studio. New technique to produce high-fidelity interactions using Origami Studio. To design visual layouts using Sketch. To adhere the principles “Error prevention”, “Help users recognize, diagnose, and recover from errors”, “Help and documentation” from the usability heuristics. Conduct an in-person testing with a functional prototype to know how the design adapts the users’ interaction.